The KDT3 is powered by a 600 MHz processor and Windows CE 6.0. 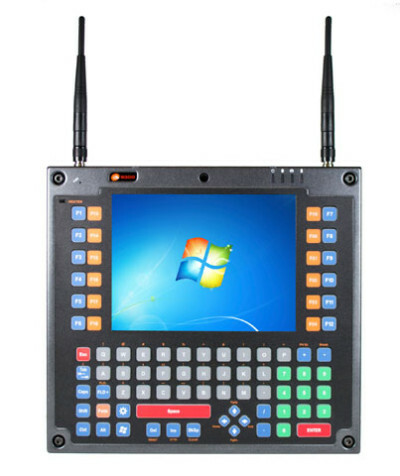 It comes equipped with an 8 SVGA color LCD with touch panel, as well as built-in Power-over-Ethernet, optional Wi-Fi radio, and optional integrated barcode scanner. With its sleek, contemporary form, the KDT3 is designed to be mounted to a wall or pole. With the KDT3 Multimedia Kiosk, customers, clients, or visitors can immediately be connected with the information they need in an impressive fashion. Whether it’s a full screen video, stunning images, or stereo sound, the KDT3 delivers in a big way, from a small package, and at an affordable price. The PM-15 is a 15" touch screen display with an impressive resolution of 1024x768. Its slim design and adjustable viewing angle make it ideal for many different applications and spaces. Built-in speakers and touch screen enhance the multimedia possibilities of the PM-15. The new VH10 combines modularity, performance and durability for workers in warehouse, manufacturing, port, yard, air and transportation environments. Customers" operational performance just got better with VH10, thanks to its rich capabilities, rugged engineering and smart designs that enable better decisions, faster response and longer continuous workflow. A fifth-generation vehicle mount computer, the DLI 9300 VMC is built to operate in the harshest of industrial environments. The 8.4" industrial-rated resistive LCD touch screen comes with an optional heated screen defroster, allowing you to operate in extreme cold temperatures as low as -22 degrees F. Multiple and concurrent operating wireless communications options with Wi-Fi, CDMA and GPRS, Bluetooth, and GPS combine with a robust dual core Intel Atom processor, memory and storage specs to deliver both outstanding performance and energy efficiency. Borrowing from DLI's previous generation vehicle mount products, the DLI 9300 is housed in a ruggedized metal enclosure with IP54-rated protection from dust and water. It also meets or exceeds MIL STD. 810F for shock and vibration, making it one of the toughest vehicle-mount computers available. Communication, data capture and collaboration across the entire supply network requires accurate, up-to-date information from the factory floor to warehouse and beyond. Manage factory floor operations, material handling activities, quality control inspections and more, using the integrated data collection technologies available in the DLI 9300 VMC. The Guardian is the latest innovation in fixed-mount computing from AML. The combination of high-performance computing power and rugged design make the Guardian ideal for tough environments that require 24-7 reliability. Its small footprint allows the Guardian to go places conventional PC's can't go, and its array of I/O interfaces gives it the kind of versatility required for any shop floor. Combining the power of a desktop computer and the user experience of a tablet, the Monarch is the ideal built-for-purpose kiosk designed for retail, hospitality and commercial applications. While providing a powerful 1.4GHz processor, a 10.1" color display, integrated 2D barcode scanning and an optional Wi-Fi/Bluetooth radio, the Monarch consumes less than 13 watts of power and comes PoE Ready (Power-over-Ethernet). The P24 Series of all-in-one computers is an ideal match for applications in the business/enterprise world, hospitality environment, and in hospitals, clinics, or doctor offices. Featuring a 24" full high-definition display, the thin-style P24 lineup comes with a powerful 4th generation Intel Haswell Core processor, and special features such as a proximity sensor and an internal UPS battery that provides backup power. P24 Series models meet Military Standard 810G and are front-panel spill proof. They also come with a 2MP webcam, high-definition audio, and wireless communications provided by 802.11 ac/a/b/g/n and Bluetooth 4.0. Additionally, the lineup includes an optional upgraded model designed specifically for the health care industry with UL 60601-1 3rd Edition certification and antimicrobial surface protection.